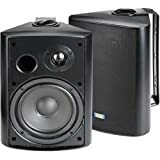 Amazon has the TIC asp-120B Architectural series 120-watt exterior patio speakers, black for $128 with free shipping. Sells for $134+ Highest Price. Deals for $89 Lowest Price. Normally $116+.